This topic contains 0 replies, has 1 voice, and was last updated by Billy 4 years, 1 month ago. I have a piece from a slideshow I do on The Changing Face of Queen Square. From here of course we are looking across toward Lich Gate.and the Mail Coach is heading toward Dudley Street. The old Gas Pillar was a round iron column about 45ft. High, fixed on a square substantial base, and having a range of steps inside to enable a man to ascend to light the ornamental globe or lantern at the top. It was erected for the double purpose of commemorating the establishment of gasworks in the town in 1821, and secondly the more practical one of illuminating the market place. Whilst it answered the first purpose , it was a decided failure in regard to the second. 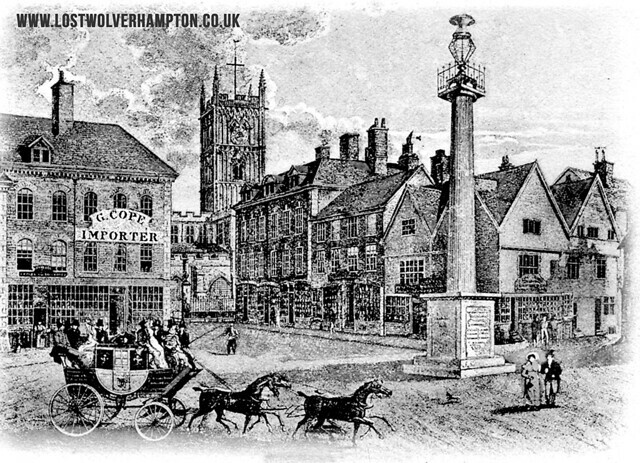 The light from the lantern was brilliant enough on a dark winters night to be seen as far away as Kingswood Common and and the adjoining village of Codsall, But It became over the years a figure of ridicule, by the locals and was dubbed the big candlestick. Owing to the great height of the light from its base, the space immediately below the light in the market place was left in partial darkness. So having been found more useful for lighting the inhabitants of the surrounding houses to bed, than to spread a halo of brightness in the street , after numerous complaints by residents of the square, in 1842 it was taken down as useless.